Gandhara was the ancient kingdom, today it is situated in northern Pakistan. The Gandhara community had a long cultural influence. In the 3rd Century BC, during the reign of Emperor Ashoka, the region became a follower of Buddhism. Later, during the rule of Kushan Empire, in the 1 Century AD, the region had maintained a good relationship with Rome. 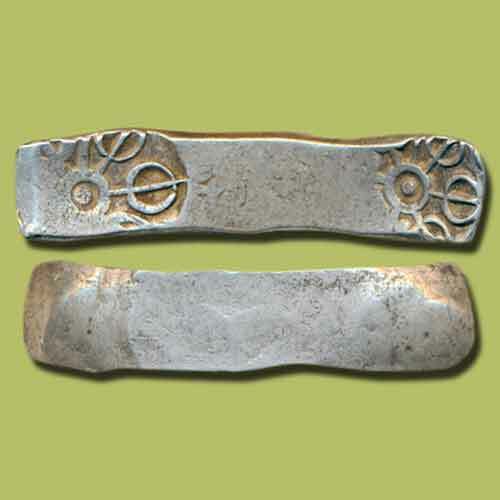 Gandhara issued coins of a concave long bar, about 1 to 1.75" in length and about ‘0.4’ in width. The bars appear to be strips cut from oblong ingots. The weight of the coin is approx. to 11 to 11.5 g. A common symbol was punched on them twice, on each at the end of the bar. The coins were struck while hot on the wooden anvil, which resulted in the concaveness of the coins.